Mary’s message was electric with meaning. Christ was risen – and the Light restored to the world. Christ was risen and was in control. 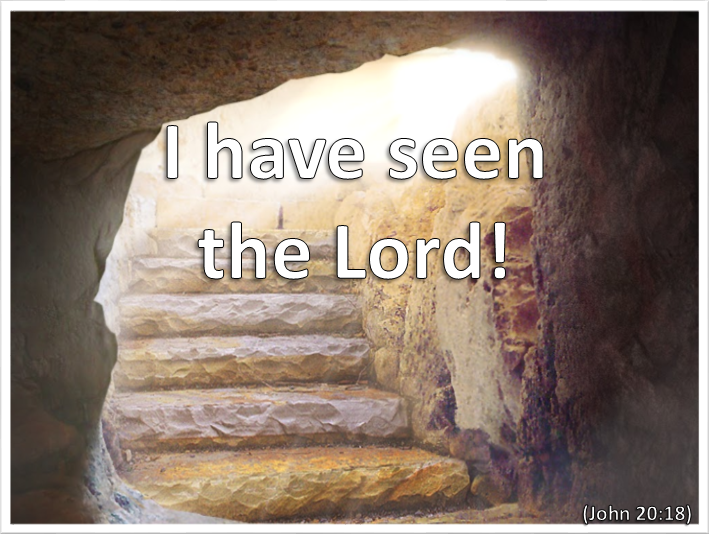 Christ was risen and still revealed Himself to individuals. Christ was risen and His purpose would be completed. Christ was risen and His kingdom would be established, in His Way. Jesus calls each and every one of us today to come to Him. To come out of the dark tombs in which we find ourselves, away from the graves of love and hope, up from the sepulchres of sadness and despair, deserting the vaults of failure and misery. Not only has His stone been rolled away. The stones of our physical, mental, emotional and spiritual crypts have been removed as well. It is the risen Christ now who calls to us. He calls us to come to Him so that He, and He alone, can give us life – a life that is not found with or through any other person or thing. Whatever our situation He calls us to put our focus and trust in Him, so that He might enter our lives and lead us forward. We do not seek Christ now at His death. We do not weep at His grave. We find Him in the everyday gardens of our lives, in the rooms in which we live and the roads along which we travel. The risen Christ is with us. We can speak with Him. Lord, open the eyes of my spirit, more and more and more to Your great and wonderful presence, power and love, In Jesus name. Amen. Death did not claim Jesus – it was His own voluntary act when all else had been accomplished. Jesus who had said that He did only what the Father told Him to do remained faithful to that commission to the very end. No one could take His life from Him – He laid it down at the time, the place and in the manner decided by the Father, whose will He accepted and carried out perfectly. Even now God was in complete control! All was done. All was achieved. Salvation was open to those who would believe. But we must never underestimate the agonised suffering in body, mind and spirit of Jesus. Nor must we overlook the anguished love of God as He watched and participated in the rejection, humiliation, abuse and crucifixion of Himself in His beloved Son. The cost was truly terrible. We are spectators in our own salvation. God give us the humility and grace to believe, accept and respond in faith. May we never take this unimaginable love, this awesome sacrifice, and the eternal consequences for us, lightly. Contemplate Jesus on the cross for you – listen for His words. Thank You Father for Your love. Thank You Jesus for Your sacrifice. Thank You Holy Spirit for showing me the Truth. Thank You God. Amen. Jesus had seen His mission and ministry through to the end. The Father’s commission and purpose were now fulfilled. He had taken upon Himself the sins of the world and would take them with Him to the grave. The penalty had been paid on our behalf by the only one who could – the spotless and sinless Lamb of God, the Son Himself. Significantly, now, something had happened. As the end approached it was not an agonising and tragic failure. It was instead a glorious and triumphant victory. 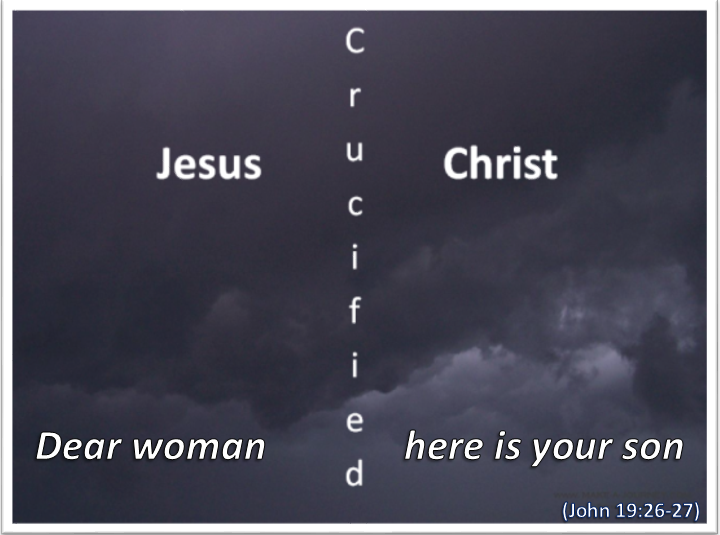 The man on the cross was not sinking into oblivion but rising to cross the finishing line. It was in so many ways His finest moment. 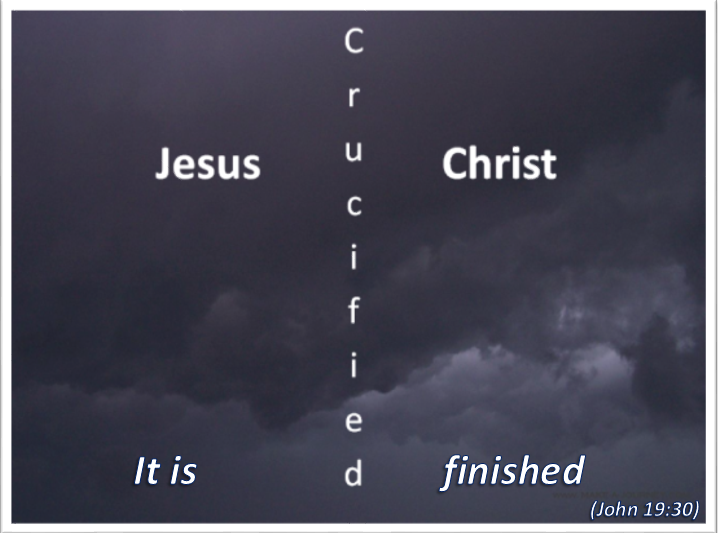 ‘It is finished’ was not the exhausted mumble of a defeated man but the cry of conquest. Matthew and Mark have it ‘in a loud voice.’ Jesus was not the victim but the conqueror. He had come for a purpose. He had seen that purpose through to the end. He had taken and absorbed both the sin of the world and its consequences. 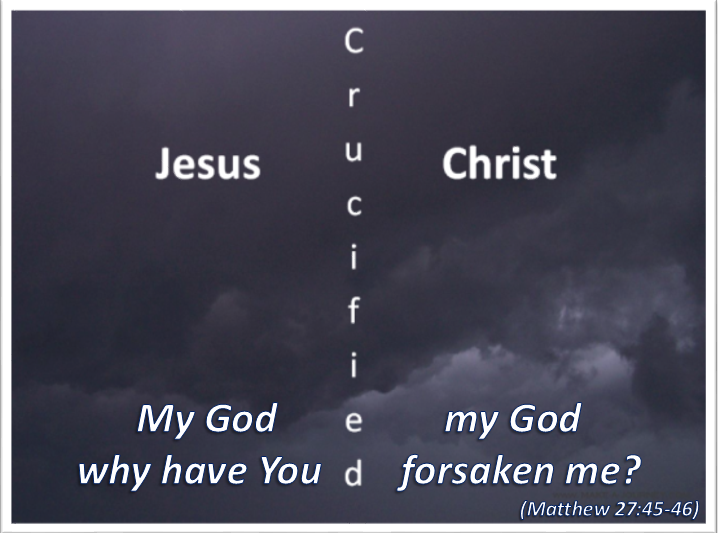 He had suffered for them and had overcome the very powers of evil on the cross. He, the Living Word, had seen the Father’s will through to its final completion which, at last, was now upon Him. It was finished. In confirmation God Himself tore the heavy curtain of separation in the Temple from top to bottom. It was no longer needed. The way home to God had been opened by Jesus the Son of God, God the Son. 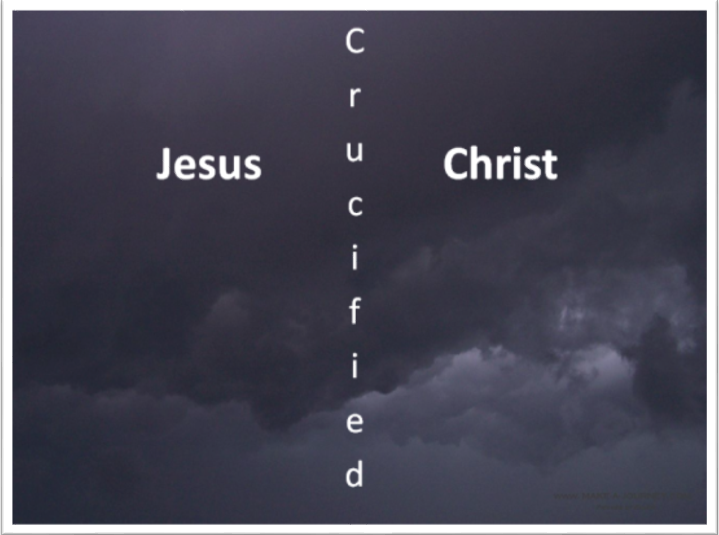 There are deepening levels at which this word from the Cross can be heard and understood. The first is the affirmation of the very real humanity of Jesus. He was not just God in human flesh – He was in fact fully man and knew what it was to be thirsty. After what He had been through, the beatings and loss of blood, and the way in which He had hung naked and for so long under the heat of the sun, it was a natural condition. The person who responded to the need certainly did not find it strange. Then, there was still something that Jesus wanted to say – something that was important for those around Him, and His Father, to hear. His parched throat was probably closing and needed to be moistened again. Some will know what it is like to be so dry that it is even impossible to swallow. 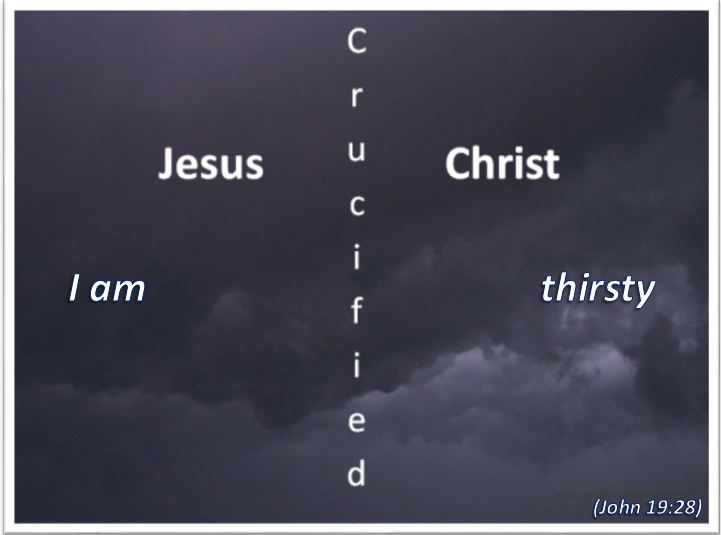 At every level of His being Jesus was thirsty – very, very thirsty – and it was all for our salvation! O God, create in me an undivided heart for You. Fill me with Your Spirit and pour Your love into me that I may truly love You – for Jesus sake. Amen. It didn’t get worse than this. For the very first time in His existence – both as Divine and human – Jesus was separated from God. The darkness that came over the land would have been as nothing compared to that which had appeared within Him. 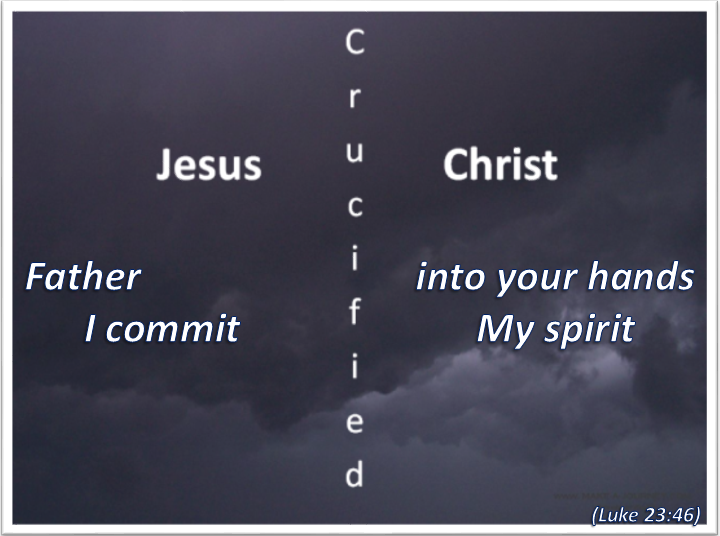 Such was the effect upon Jesus that it tore this cry from the very depths of His spirit. Jesus had taken our sin upon Himself. It brought about this terrible separation. As ‘the wages of sin is death’ so sin brought death to their intimacy and consequently death to the Jesus who was fully man as well. In terms of His own illustration the branch had been cut off from the Vine – to be thrown into the fire and burned. Jesus experienced the deepest and blackest spiritual hell so that we would not have to. Steadily, and seemingly without end, the sin and sin guilt would have poured upon Him. and all the other sin and sins of the countless individuals from the beginning to the end, and of all the nations and even the churches as well. He would have sunk beneath the weight of sin without number or end, and been spiritually suffocated by the rising tide of thick and impenetrable darkness. Alone, lonely and desolate, Jesus hung there. Jesus hung determinedly on – to set us free. How easy it is, when we are absorbed in matters of consequence, to forget the needs of those nearest to us. Very often too the calls and demands of others take precedence over those of our own families. Jesus was not just hanging on the cross, like the two other dying men, waiting to die. He was involved in a battle of immense proportions – on the final outcome of which depended the future of all humankind, past, present and future – and the worst was still to come. In the face of such enormous pain and pressure, with the most terrible consequences if He failed, He still found the time and the love from which to care. Years before, when His mother and Joseph had taken Him into the Temple to ‘present Him to the Lord’, they were met by a faithful man named Simeon who, after blessing them all, concluded by saying to Mary, “And a sword will pierce your own soul too.” How deep and how excruciating must have been the sword that pierced her now as she stood and watched her son’s continued rejection, humiliation and suffering. This was one pain of His that she could not make go away. But He, out of the midst of that pain and the particular struggle in which He was involved, reached out to her and provided for her as best He could. His beloved John would look after her for Him. Wherever we are, and whatever our involvement, there will probably be someone who looks to us for love and attention. No matter how much they might understand the demands made upon us it might still sadden them when they feel ignored or taken for granted. It might delight and cheer them if we turn to acknowledge them and love them in some way. If Jesus could do it from the cross there is no excuse whatsoever for us. He just cared so much for this ‘dear woman!’ She had been honoured in His birth, He had honoured her in His first miracle and now He honoured her as He died. Lord God, please help me to show my love to the special people whom You have placed near me. Amen.